Theatre Olympics at the Tagore Hall turned folksy on the World Theatre Day on Tuesday. 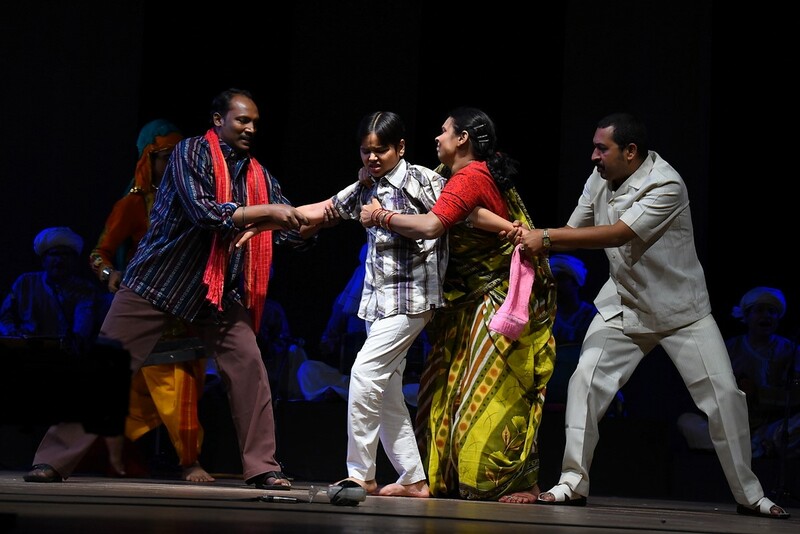 Bharatiya Jan Natya Sangh’s Gabarghichoran ke Mai with close to twenty-five members in its cast brings a flavour of a regional folk theatre variety. 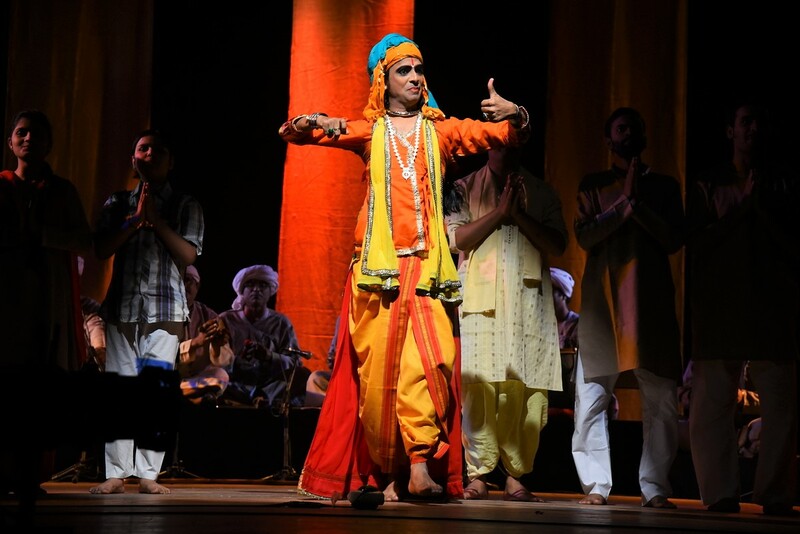 The curtain opens on one-score strong Chorus seated upstage, singing men and women, including those turbaned and sari-clad, with accompanists on the tabla, naal, manjira and harmonium and so on. 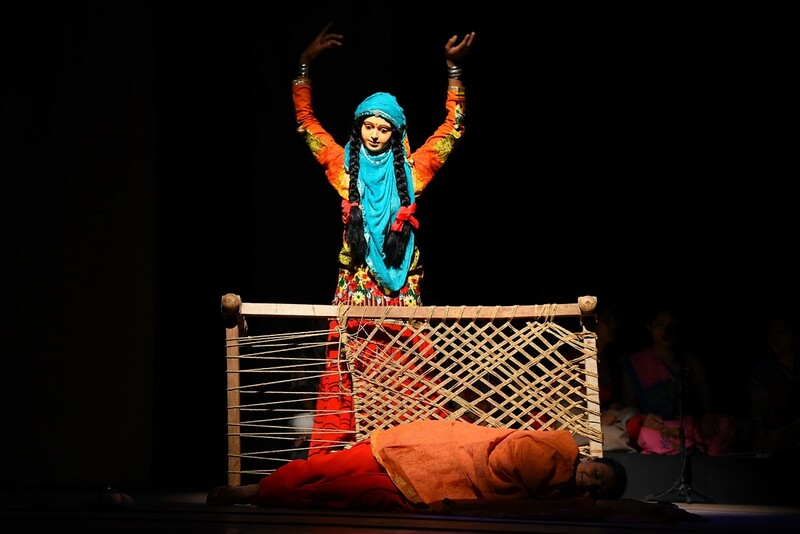 In the central acting area you see a young man (Sudama) dancing, who turns his back and you see a masked young woman. The rustic Bhojpuri charm sets the mood. Young viewers cheer the lusty style. It’s the freshening smell of the soil, missed in today’s popular urban theatre that is so welcome. The bride and the bridegroom are welcomed home with songs and wicker baskets receive their first steps. Romantic imagination gives way to hard realities. Rather crudely setting aside the young wife’s (Shweta) pathetic entreaties, Galeej (Piyush) leaves for Kolkata to make a fast buck. 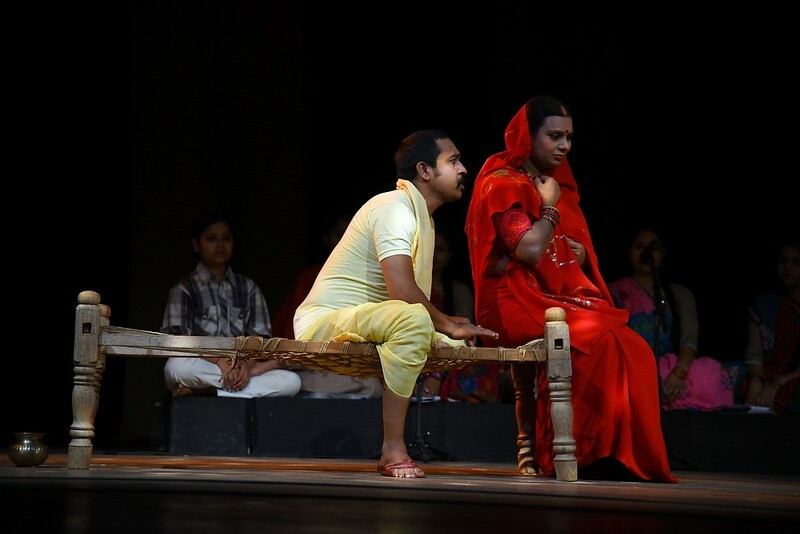 In his absence, here Garbadi (Deepak), a village youth, seduces her and she has a son. 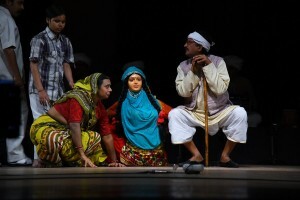 When Galeej returns, for the possession of the son in early teens a Brechtian situation arises and the dispute goes to the Panchayat. In conceiving of the end where the Sarpanch has to decide whether the child should go to the young woman or to either of the two headstrong men instead of the Judge in The Caucacian Chalk Circle having to give his verdict in favour of either of the two women, playwright BhiKhari Thakur (1887-1971) has certainly addressed a contemporary social concern. It is too simplistic, however, to equate this noteworthy Indian playwright with the German celebrity playwright Bertolt Brecht. All said, the treatment of the story and the theme lacks depth and sophistication. Yes, here too there is a narrative and it is spread over many years. There are a chorus and a narrator here. The scenes are short. Many of them, however, are sketchy and not tightly built, the unfolding narrative does not have an epic flow and of the three major characters, only Bahoo breathes with life. Images picked up from the local rustic life built into the arguments by the three characters who claim the boy are refreshing. In the latter half of the play, the actor playing the modern Sarpanch (Ashutosh) emerges as a good actor. In view of the play’s performance out in the open generally in their region perhaps, the singing and music are loud and robust. Dramatic happenings supported by music besides regional customs and costumes remain engaging. Enviably, all actors are singing actors! At the discussion following the performance, the director, Tanveer Akhtar, who has also developed the performance text, proudly pointed out that they do not necessarily have any formal training. They pick up the rhythm while working with the group.